Happy 2013! ~ Journal of a dreamer. Happy 2013! I can't believe that 2012 is already over! 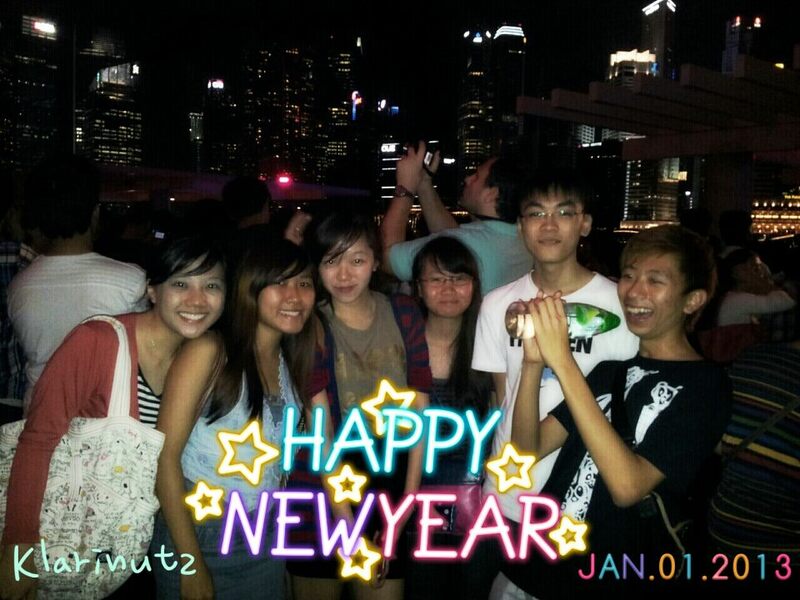 I went to Marina Bay to countdown together with my Klarinutz juniors. Haven't seen them for such a long time and how I've missed them! We went to eat dinner at Barcelos. I found the food only so-so for the price that I paid. I won't really want to eat there again unless someone treats me haha. Had some HTHT and some crap though. Things have changed so much after we have left school. 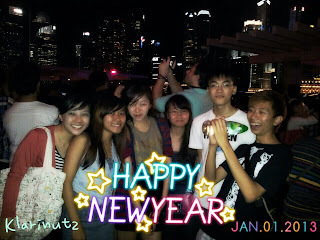 We took a bus to Esplanade. Haha Yi Jun has never been to the Esplanade area in his whole life I think. -.-''' We reached there at around 8 pm, but there were already so many people lining the streets to catch the fireworks. If it did not rain so heavily earlier on, I'm pretty sure that the number of people there would not have allowed us to even walk to MBS. That's how scary the crowds there were. MBS was really very, very packed when we reached there. It was so difficult to move about. I think it's like walking through Chinatown during the days leading up to Chinese New Year. We wanted to go to TWG, but looking at the queue was enough to make us wonder why people were still willing to queue for it hur. I think you had to wait for about 1 hour before you could go in lor. 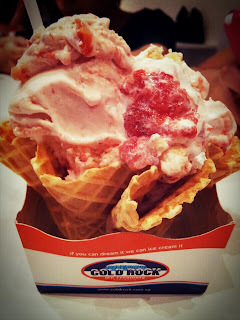 We walked and walked until we found Cold Rock Ice Creamery. It was very packed too, but luckily we managed to KS another family who was eyeing the table with the squishy sofa HAHA. I think they did not see us because we were waiting in the other corner. Bought the $12 Strawberry Shortcake waffle ice-cream. It was really on the high side, but it tasted so yummy! I don't think I can bear to eat it another time though. We stayed to play cards after that before the place got more crowded. We lagged around the area because too many people were going home at the same time. When we walked past Raffles Place MRT the policemen on duty even had to restrict the number of people going into the station, so you could really see long queues forming outside the station. Yi Jun was feeling hungry so we decided to head over to Lau Pa Sat to eat supper. We had to walk such a long way there because the roads were all cordoned off for the countdown. Lol, whoever's New Year resolution was to slim down would definitely have fulfilled theirs by walking with us lol! We stayed until 2 am before we suddenly had the sense to check what time the last train would leave. Luckily we checked lor, if not we would have to spend the night at Lau Pa Sat haha! Anyway, we parted ways at the MRT station because the rest were taking the green line while only Farah and I were taking the red line. I reached home at around 3.30 am. It was so scary to see the station being so empty except for a few other people. I wanted to take the bus home but none of the buses were running, so I had to walk back home from the station. So scary lor, because it was so quiet and I was imagining all sorts of things. >.< I went to bed at around 5 am haha. I couldn't sleep as early as I wanted to because my hair was wet. And woke up at 2 pm haha.